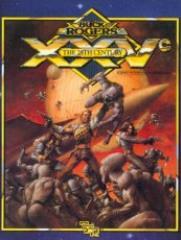 The XXVc Role-Playing Game describes the world of the 25th Century in vivid detail. Join the forces of the New Earth Organization and help Buck Rogers and his allies to fight the tyranny of the Martians; team up with the other members of your group to buy a spaceship and go into business yourselves, running blockades or carrying vital supplies and information; make a fortune (or lose one) by visiting the solar system's biggest casino in the Asteroid Belt. All of these opportunities, and countless others, are open to players of the XXVc game. In the world of the 25th Century, the sky is NOT the limit - it's just the first small step on a long and exciting journey! • Characters & Combat, a 96-pages book of rules. • The World Book, 64 pages of information about the places and people of the solar system. • The Technology Book, 32 pages of description about the equipment and weaponry of the 25th Century. • A special see-through measuring device for moving ships between planets. • A sheet of die-cut ship counters and markers. • A foldout referee's screen with all the charts and tables needed during play, plus a set of dice.